Global warmning? Not in England it’s not warming. It is definitely the coldest winter since I moved 10 years ago. And it doesn’t look like it will be getting much warmer either. 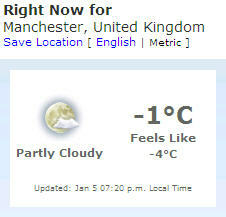 Tonight we’re expecting a whopping -7C!! Jeans, tights (thick stockings), thin socks, thick socks, long sleeved t-shirt, fitting jumper and a very warm cashmere jumper. And that is inside the heated house! The good thing is: the weather has been beautiful. We have had fantastic blue skies and bright days. All you want to do is go out and walk in it, but instead we’re back at work.